For British rock band, see Cream (band). Cream (also called milkfat, milk fat, and butterfat) is the fatty part of regular milk. Skimmed milk (or skim milk) is milk sold with some or nearly all of the fat removed. Cream is usually used in coffee to make it lighter in taste. The Simple English Wiktionary has a definition for: cream. 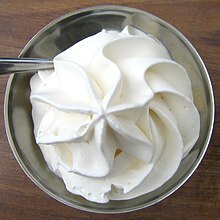 Wikimedia Commons has media related to Cream. This page was last changed on 23 August 2017, at 00:56.